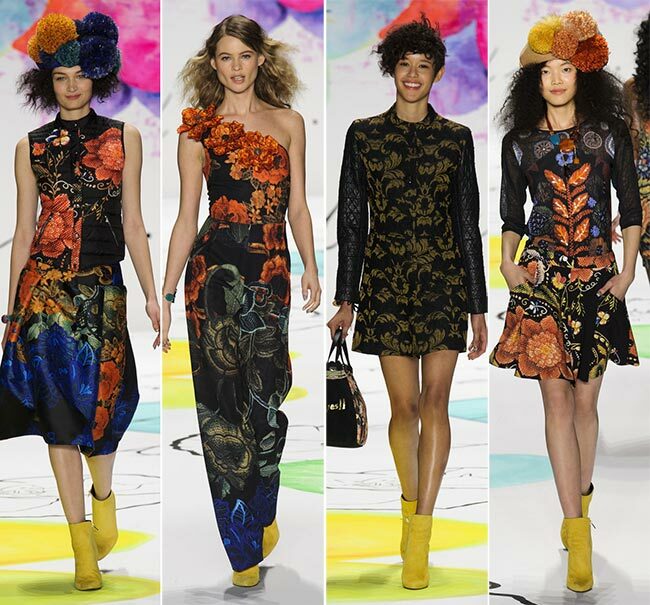 The Desigual fall/winter 2015-2016 collection presentation at New York Fashion Week fall 2015 was a celebration of love, life and joy, something which the Spanish brand has gotten us used to. 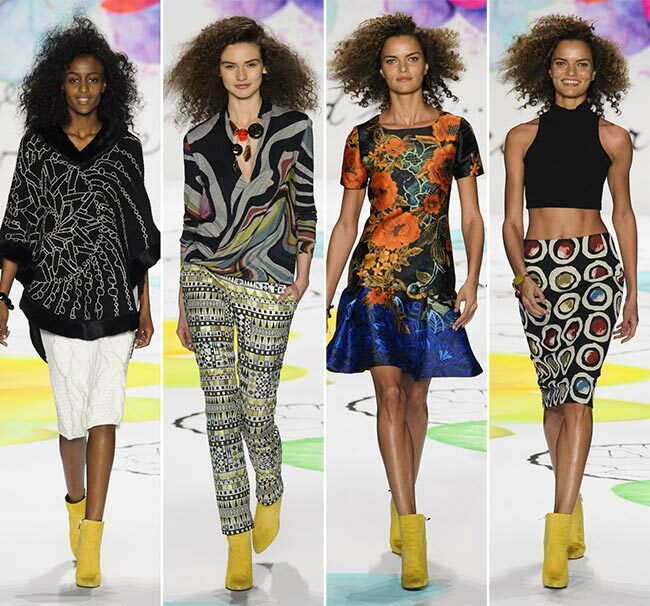 As always, we were treated to a big abundance of bright colors and eye-feasting prints that are the signature details of the hippie-chic brand. 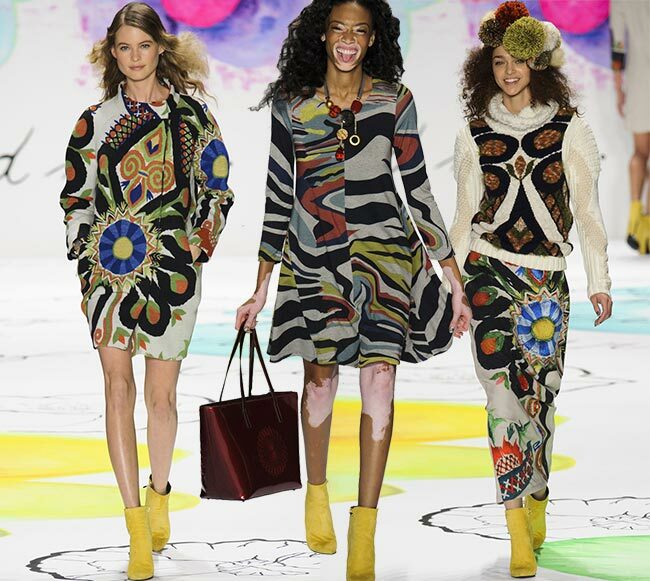 With Behati Prinsloo and Chantelle Winnie profoundly strutting on the runway, Desigual created a real party where the models were dancing, smiling and looking drop-dead gorgeous in bright floral and fruit printed clothing pieces. 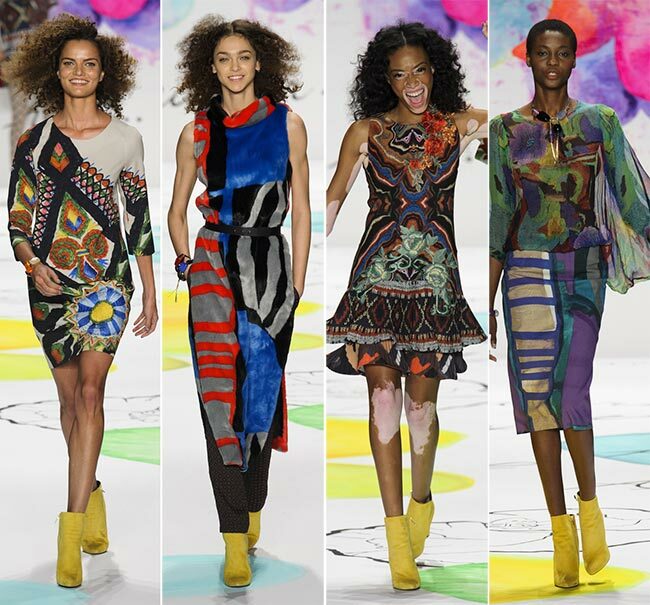 From the message “my gaze followed her’ appearing on the background to the funky and creative outfits showcased, the entire Desigual show was an ode to freedom, encouraging its customers to wear what they like and to enjoy the life to the fullest. It’d be hard to single out any color available in the Desigual fall/winter 2015-2016 collection, since it’s a real cavalcade of bright and bold hues, from reds and oranges to yellows, blues, greens and purples. Abstract, graphic, geometric, fruit and floral prints come fused with interesting ethnic motifs, creating a vibrant and energizing mood on the runway and promising a winter full of colors. The diversity of the materials and silhouettes used is another aspect that turns the collection into a multifaceted one, which has the right outfit for any occasion and for everyone. Even if you aren’t much into such bold and fun prints and colors, there is a part dedicated to monochrome whites and blacks, which still look fresh and modern. While the flirty chiffon dresses are ideal for the transitional days, it’s really pleasant to see the models come down the runway in cozy chunky knits, be that a knitted sweater or a sweater-dress. The warm and absolutely cool patterned outerwear options are other pieces that promise a warm winter without sacrificing over style and the typical bright Desigual mood, while the knitted hats worn with super big hair are sure to become must-have details for standout winter looks. Although a youthful and flirty style is the focus of the entire Desigual fall/winter 2015-2016 collection, there are also elegant and feminine offerings for the more mature customers. The printed pencil skirts with slits on the back teamed with flowing printed chiffon blouses will appeal to the working class ladies, who want to take their office styling to a whole new level. In addition, there we have knitted pencil skirts toped with oversized knitted tunics for the days when you want to feel both feminine and warm. It’s not just about dresses, skirts, knitwear and outerwear, since we also love the printed pants, the midriff-exposing simple crop tops, the Seventies style palazzo pants matched with the floral printed top and the stylish backpack, the one-shoulder-off jumpsuit and the the capri pants adorned with autumnal flower prints. 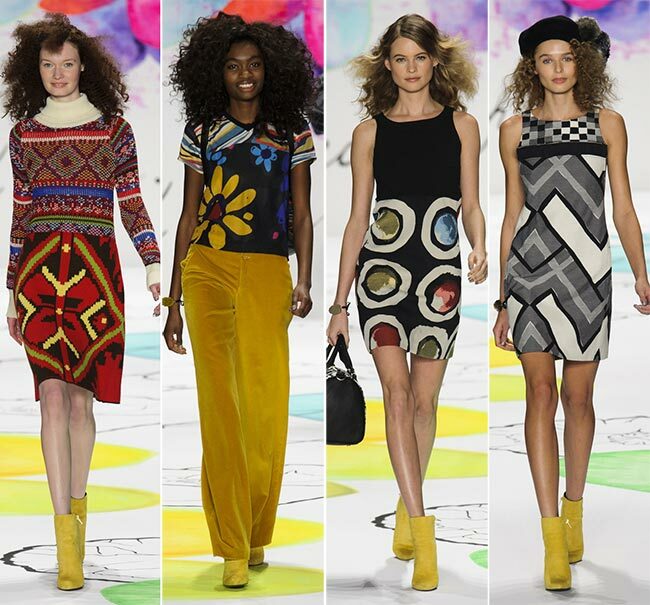 The looks showcased were accessorized with yellow ankle booties on heels, eccentric headwear pieces and typical Desigual bags coming in different sizes and shapes. 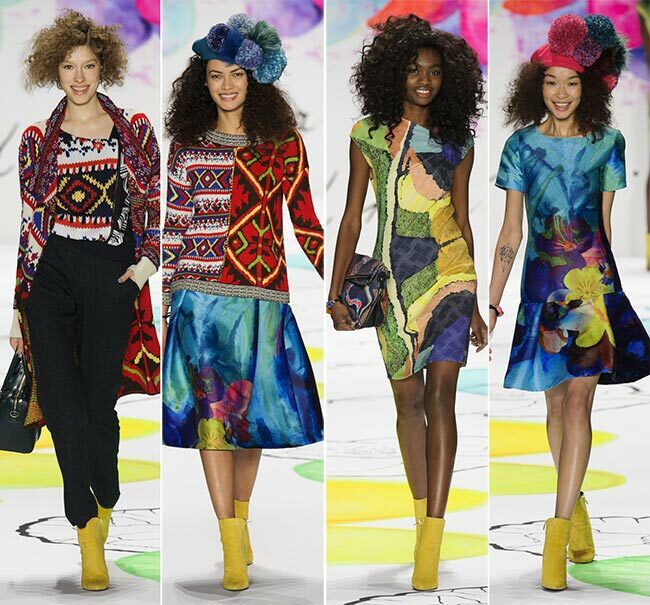 What’s not to love about the Desigual fall/winter 2015-2016 collection, as “la vida es chula’ and the winter is super bright with the Spanish brand!